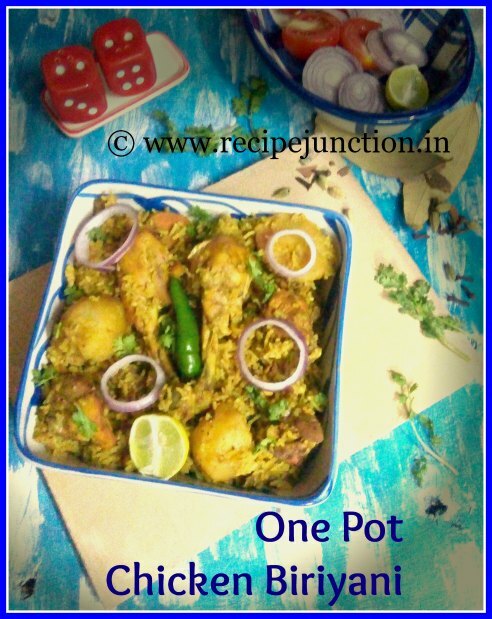 Have you ever thought to cook a Biriyani in only One-pot? 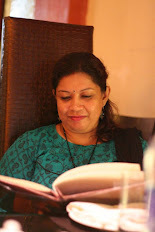 Or with just a few common ingredients which you always have in any Indian Kitchen? 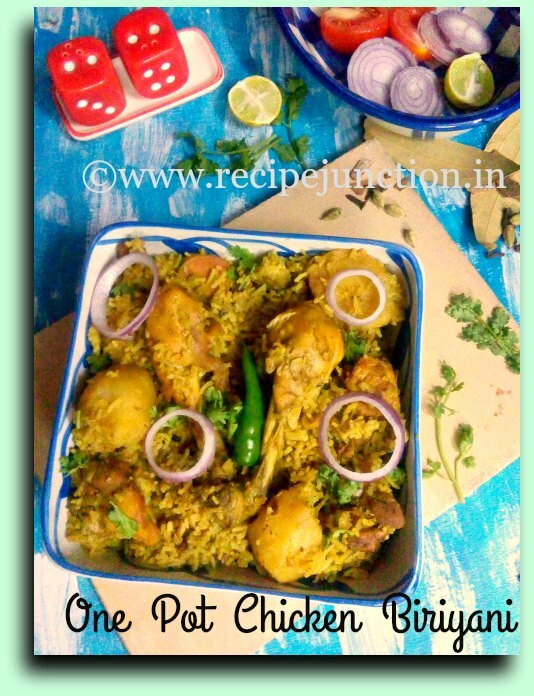 Even I thought it was impossible till I tried to fulfill my daughter's wish to have Chicken Biriyani with just a few hours notice? First, I thought it's not possible, then I thought to give it a try even though I didn't have those exotic spices needed for Biriyani in my pantry. Over that, I was so squeezed of time that day. But the food blogger spirit in me forced me to go ahead and give it a try. 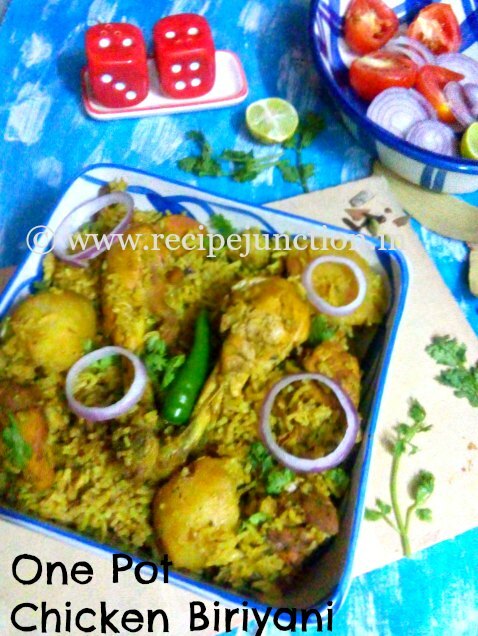 And It was equally delicious like the biriyani I made before with elaborate recipes and exotic spices. Ginger-garlic paste : 3 tblsp. Turmeric Powder : 1 tblsp. Coriander powder : 2 tbsp. Cumin Powder : 2 tblsp. Garam Masala Powder : 1 tblsp. Kewra Water : 1 tsp. Cut whole chicken in medium bite-size chunks. Marinate them with yogurt, 2 tblsp. ginger-garlic paste, little salt and turmeric powder for at least 1 hr. More is merrier. Take the rice in a bowl, wash and then pour about 1 cup water over it and let it soak as long as chicken marinates. Heat 2 tblsp. oil on a wide bottom pan, fry the potato pieces, adding little salt and turmeric powder. Fry till they are golden brown, keep them aside. In the same oil, temper oil with pounded bay leaves, cardamom, cinnamon and cloves, then add sliced onion and saute till they have started browning. Then add chopped green chillies and 1 tblsp. ginger-garlic paste, saute for 2 minutes, then add marinated chicken in the oil. Add all the powdered spices except garam masala powder. Cook stirring till the oil and spices separate. Add fried potato pieces and mix with the chicken. Add 3/4 cup warm water in the curry. Add salt as needed, cover with lid and let the chicken cook till they are just done. By now, all the moisture from the chicken will be gone. Add soaked rice along with the water it was soaked in the same pan. mix well with the chicken. Add ghee, garam masala and Biriyani masala(if you're using) over it. Mix again. Add water just till the layer of rice and chicken in the pan. Add salt carefully as we had added the rice now. Sprinkle chopped coriander leaves on top. Close the lid and in medium heat and let it cook for 5-6 minutes or till the moisture in the pan is evaporated. Stir time to time to avoid rice sticking to the pan and burning. After this, place a tawa on heat and place the pan over it, where you were cooking the biriyani, Sprinkle kewra water and meetha attar on top and close with a lid as tight as you can or you can seal the rim of your pan. Now lower the heat to low and let it cook for another 10-12 minutes or till rice is fully done. We are doing this as there is no moisture in the rice and we can't keep the pan in direct heat. So, we are cooking it in DUM. Finally, remove from heat and fluff rice and chicken together and give it a good mix. Serve hot with freshly cut salads and any kind of raita by the side.